This is the bed right at the rear of the yard that I planted the summer before last. The peonies were hidden under weeds, and the rest of the bed was bare except for some suckers from the original rose bed. I dug up those and replaced them with hostas from other parts of the yard and three large leaved variegated ones I bought on sale that fall. I actually told someone the other day that this bed was planted when we arrived, I had forgotten doing it until I was sorting through some photos from that summer. 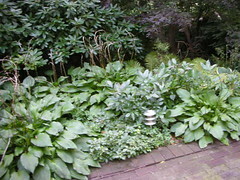 Looks like I could think about dividing these hostas again, we've plenty of bare spots where they could go.